While it was several years ago, I’ve covered the basics of “beef-on-weck” before with my review of Charlie the Butcher over in Williamsville by the Buffalo airport. It’s a classic variation on the roast beef sandwich: roast beef and horseradish piled on a crusty roll resembling a kaiser roll, but topped with kosher salt and caraway seeds. Really, it’s a good combination: the crusty roll soaks up the juice from the meat, and the salt and caraway seed add some nice flavor. 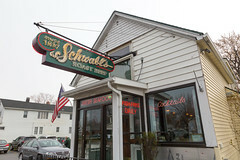 Unlike the other main Buffalo dish, the Buffalo wing, the origin stories on the beef-on-weck is a little more vague, and many a (mostly friendly) argument has been had about which place does the best version, but there’s one undisputed fact: Schwabl’s has been serving these sandwiches up for a long time (since 1837 in general, and in this exact location since 1942). Walking in the door at Schwabl’s, the joint is distinctly different than Charlie the Butcher’s. The latter is like visiting a butcher counter: it’s bright and shiny and decorated somewhat like a butcher shop. 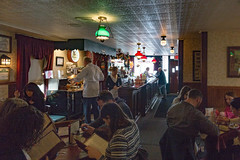 Schwabl’s, however, is distinctly a bar and restaurant: dimly-lit, and vaguely German in decoration, the front half of Schwabl’s (the “front door” is functional but primarily decorative, the main door is on the side) is built around a large, ornate wooden bar, while the back half of the restaurant is round tables packed cozily into the tavern space. 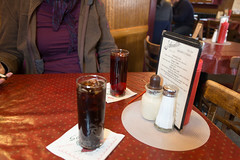 And Schwabl’s isn’t just a beef-on-weck joint, it’s got a fairly complete dinner menu of sandwiches, salads, and dinner plates like turkey, as well as a variety of beer, cocktails, and other drinks (we opted for some locally made birch beer, another thing I enjoy about the Buffalo area). But the real attraction is at the end of the bar, where one of the waitstaff, seriously attired in a butcher’s jacket, occasionally removes a roast from the drawer and carefully cuts slices off of it as each order comes in. It’s practically a ritual. So that’s what we ordered, myself opting for German potato salad and cole slaw as sides, and Carol going for beets instead of cole slaw. A small nit here: my favorite roast beef sandwiches, beef-on-weck included, I like served still rare-red and dripping, and that’s definitely not the default at Schwabl’s, with “medium” being the primary choice (although the waitress was more than accommodating in having our sandwiches done with as rare a cut as they could pull off). A few minutes later, our sandwiches arrived. Overall, I have to say, Schwabl’s has been my favorite beef-on-weck for years, and this remains so. The beef, despite being a little more cooked than I usually prefer, remained flavorful and very juicy, served up rather generously on a weck roll. The weck roll was the right combination of textures, with a good crusty exterior and a fluffy, soft, and absorptive interior, and without too much salt (although I wouldn’t mind a bit more caraway, in this regard I prefer Charlie’s). 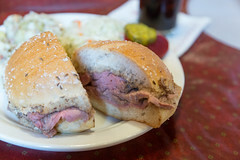 The combination is one of the better beef sandwiches in existence, and the crustiness, salt, and caraway all combine to make it a fairly unique but enjoyable combination. The sides weren’t shabby, either: while the cole slaw was reasonably good, the solid performer on my lunch plate was the German potato salad: rich, tangy, and more than a little bit of smokiness from bacon, this was a really good potato salad. 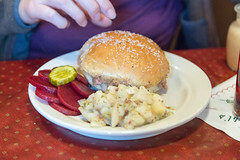 Carol’s beets were also nicely seasoned and made for a nice counterpoint to the salty weck roll. So yes, there’s a reason why Schwabl’s remains popular over the decades: they continue to produce one of the best roast beef sandwiches to be found. I’d be more than happy to come back (although one of these days I’ll have to try some of their other menu items, like the impressive-looking ghoulash). My friend Karla wanted to meet with us for a mid-afternoon snack while we were in Phoenix. She recommended that we get pie at Linda’s, which is at 24th and Osborn in Phoenix. It’s a little hard to find, since the only obvious name on the place is BJ’s (from the previous business name). However, it was worth our effort tracking this joint down. Despite the non-descript exterior, Linda’s has quite a good selection of homemade pies. Our group opted for Coconut Cream, Banana-Chocolate (shown here), and Cherry. Mine was the Banana-Chocolate, which was pleasantly creamy, not too banana-y, with a good substantial flaky crust and a nice chocolate flavor.